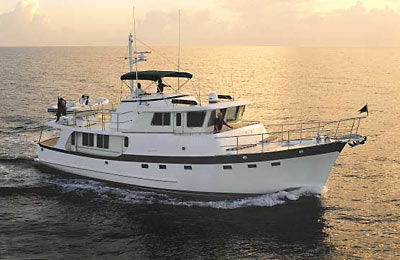 Help Finding the Perfect Trawler! Click Here to Share Your Goals! Let us Sell your Trawler! Listings Wanted - World Class Expert Service -We get the Job Done! Welcome Trawler, Long Range Cruiser and Expedition Buyers! Please check out our custom searches and featured Trawlers for Sale! The name ‘trawlers’ comes from the name given to commercial netting boats which are known for running slow and efficiently with long range. This term has crossed over to the yachting industry. Trawlers are fuel efficient yet rugged, seaworthy designs designed for blue-water and long-distance operation. Many mid range trawlers are built of fiberglass up to around 80′ (24 m). Larger trawlers or LRC (long range cruiser) yachts are typically made of aluminum or steel. In order to be fuel efficient, trawler engines are limited to only achieve a lower horsepower for hull speed, which is known as displacement speed. Full displacement hulls are for the yacht operators who value distance and comfort over speed. Trawlers typically have deeper drafts than motor yachts for sea keeping ability. Large luxury yachts in the 120′ (40m) plus range typically share the same displacement characteristics as trawlers as the weight does not justify the fuel cost to make the LRC (long range cruiser) yacht go faster. Trawlers typically have a round chine, or a hull configuration with a curve near the waterline instead of a hard chine typically found on semi-displacement motor yachts. This hull design has been proven over many centuries to be the most efficient at this speed as well as offering the most volume. With this in mind, many trawler yachts (LRC yacht, expedition yacht) employ stabilizers to minimize roll. Stabilizers have different designs; the most common being the fin type with hydraulically controlled gyros. Bulbous bows are often found on these displacement style hulls. Large commercial vessels use a bow stem to break the water in front of the vessel and thus reduce the water friction , which saves fuel. How much range do Trawlers Need? Many yachtsmen are drawn to the idea of crossing oceans and exploring the far reaches of our wonderful globe – thus the name of Expedition Yacht. Note that in order to cross the Atlantic ocean, a range of 3,000 nautical miles is needed! The longest passage in the world is 4,000+ nautical miles (Indian Ocean). Most ice-bound regions require a yacht with special reinforcement, especially around the bow waterline area. The good thing is that with enough range you don’t have to plan your trip for fuel stops which enables voyaging to many more destinations! Asia imports small to mid-sized trawlers for the US market. LRC trawler from Asia include Fleming, Grand Alaskan, Grand Banks, Kady Krogen, Selene and Nordhavn. Kingship and Cheoy Lee are from Asia and building world class trawlers for sale and LRC (long range cruiser) yachts. North American trawler builders include Palmer Johnson, Realship, Trinity and Newcastle. Europe, particularly northern Holland produces some of the finest, high-end customs trawlers in the world – builders such as Kuipers, Lowland and Heesen have produced some masterpieces in the world of trawlers and expedition yachts. Inace in Brazil has been exporting trawlers over the last decade. 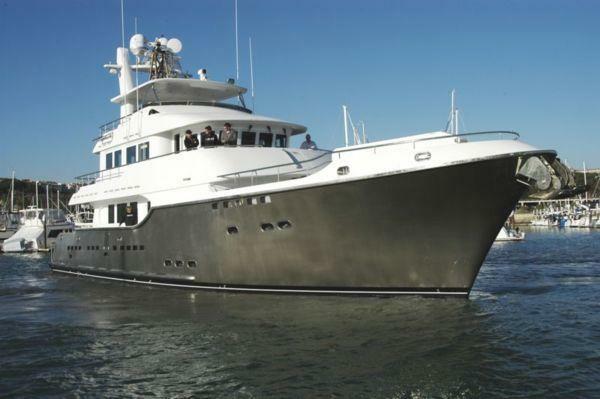 Trawler yachts, LRC yachts and Expedition (typically a larger trawler) yachts are a quickly growing category of yachts for the adventure minded yachtsman. Some commercial ships have been converted into yachts for personal use. 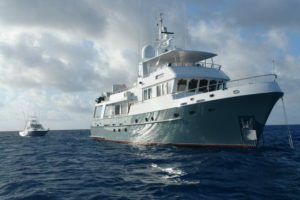 Converting a commercial ship into a yacht quality expedition yacht requires a great deal of expertise. However the rewards are great for the persons who wish to visit the far reaches of the world! Are you considering the purchase of a trawler yacht, LRC yacht or an expedition yacht? Ak Yachts of Fort Lauderdale offers expert advice and guidance for all types long range yachts! We are highly experienced ex-captains with plenty of experience and interested in saving you time, effort and $$$! Please contact us at (954) 889-7330 or email info@akyachts.com to share your goals!